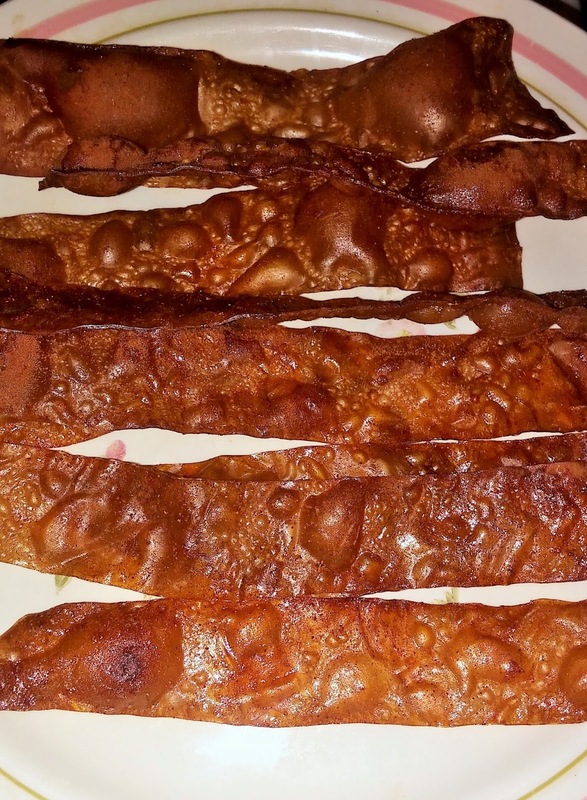 I finally jumped on the rice paper bacon train and I'm so glad that I did! Whoo, whoo! 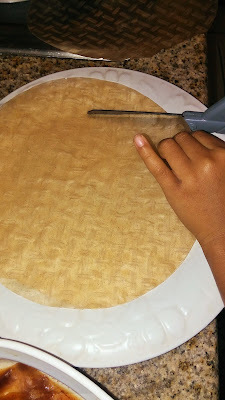 After a couple of experiments and a bunch of rice paper chips, I came up with a simpler way to prepare the rice paper and cut the strips without cracking the paper. 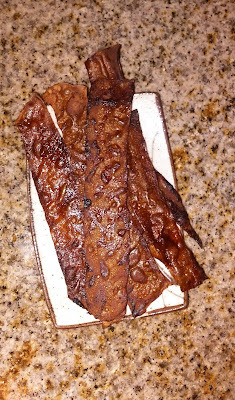 You can use any marinade that you like for these, but I recommend using some smokey ingredients to give you a nice bacon flavor. Before you begin, preheat oven to 350 degrees and prepare baking sheet with a layer of parchment paper. 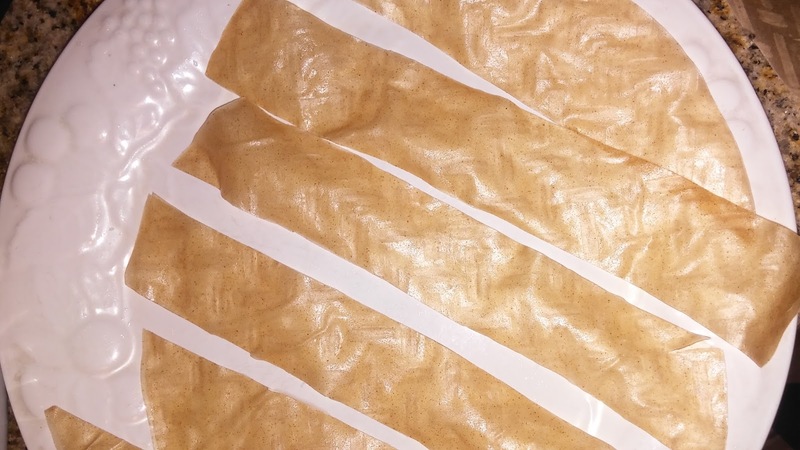 6 pieces of rice paper spring roll wrappers. I use brown rice wrappers. Put enough water in a dish or plate large enough to fit your whole rice paper in or you can just run them under the faucet. 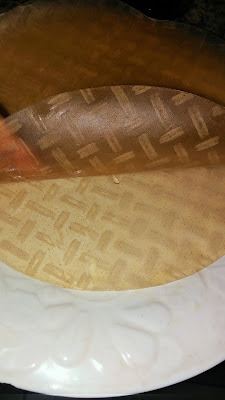 Wet 2 pieces of rice paper and stick them together. 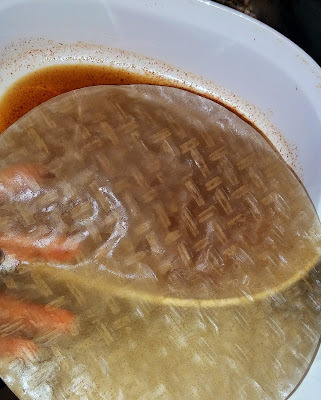 I use a plate filled with water to wet each side and then lay them on top of each other to adhere. It takes a few seconds for them to adhere. Rubbing them while laying flat helps them to stick together. Repeat this with your other 4 pieces. This is 2 pieces stuck together, before cutting. Once they're all stuck together, cut strips. 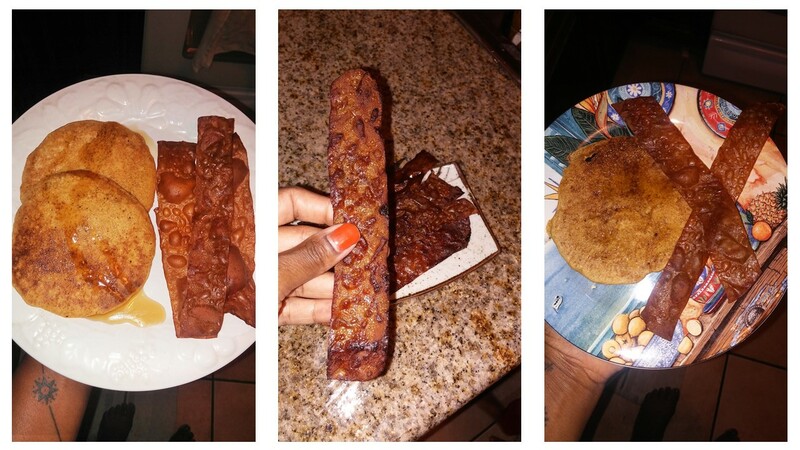 You can make these as thin or thick as you like. I try to cut into standard bacon size pieces that are easy to handle. The kids love to help making these. K cuts and S dips them. 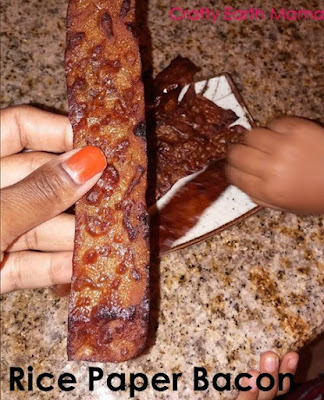 When they are cut, do not lay them on top of each other. If you do, they will stick together. 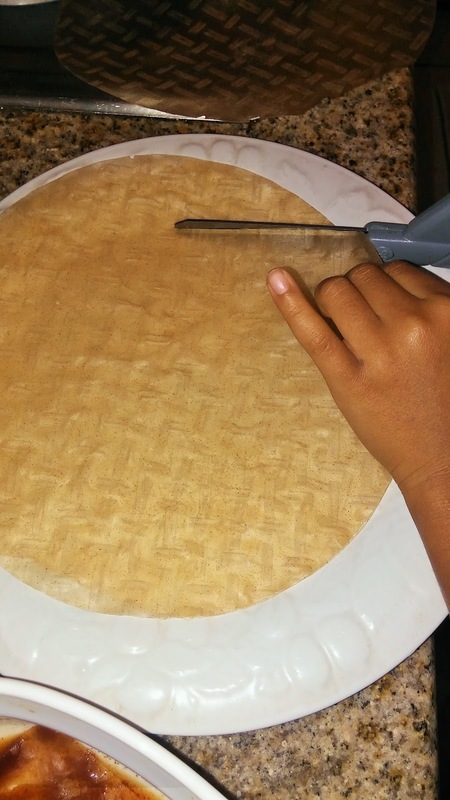 Lay them apart or use wax paper to separate. You can also put them into the marinade directly from cutting. The marinade will keep your strips from sticking together. Cut and ready to go into the marinade. 1tsp smoked paprika, you can also use liquid smoke, if you prefer. You will need less of it. 1/2tsp melted coconut oil, optional. I've done it with and without the oil. It's good without, but the oil bring a texture I like more than without. 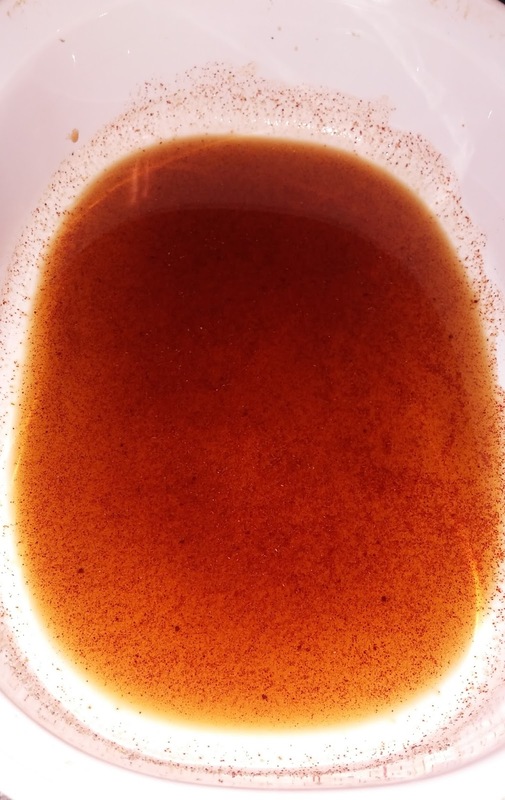 Mix marinade in a shallow dish. Lay each of your strips into the marinade. 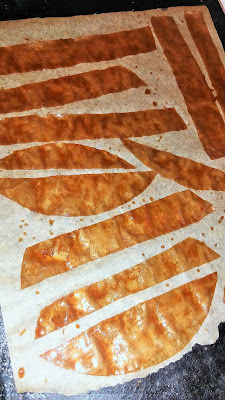 Once the paper has soaked up some of the marinade, flip them over. Be sure every piece is coated thoroughly. 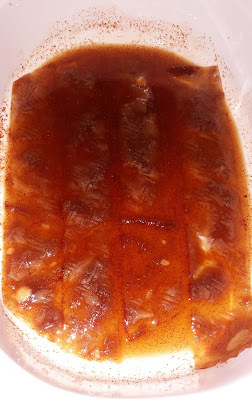 I let the strips soak in the marinade for a couple of minutes each side. Move them from the marinade onto your baking sheet covered with parchment paper. I drizzle some of the remaining marinade on top of each one before putting them in the oven. Bake for about 10 minutes until bacon strips are brown and bubbly. Keep watch, because they can burn fast! Some parts may still be slightly soft when you remove them from the oven, but crisp up when cooled. If they come out chewy, let them bake a little bit longer or you can enjoy them as is! These are with no oil and no molasses. These have oil and molasses. We've had these with pancakes, on sandwiches, potatoes and by themselves for a snack! Let me know below if you have a great marinade that you love and how you eat your rice paper bacon. Enjoy!